You could cut the triumphalism on the climate science denialist blogs right now with a hardback copy of George Orwell’s Nineteen Eighty-Four. Their unbridled joy comes not in the wake of some key research published in the scientific literature but in the fact that a climate sceptic has got a mainstream newspaper to give their conspiracy theory another airing. The sceptic in question is Dr Jennifer Marohasy, a long-time doubter of human-caused climate change whose research at Central Queensland University (CQU) is funded by another climate change sceptic. I chose the Nineteen Eighty-Four analogy in my introduction because it is one of Marohasy’s favourites. She likes to compare the work of the Bureau of Meteorology (BoM) to the various goings on in Orwell’s fictional dystopian novel. The conspiracy theory is that BoM is using a technique to selectively tamper with its temperature data so that it better fits with the global warming narrative. The people at NASA are in on it too. Now the great thing about conspiracy theories is that, for believers, attempts to correct the record just serve to reinforce the conspiracy. Like a video clip of the moon landing on a constant loop, the whole thing feeds back on itself. 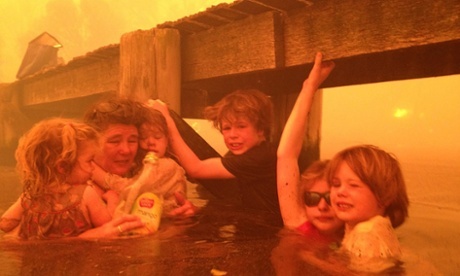 Correspondence posted on Marohasy’s blog shows she has been pushing her claims for months that BoM has “corrupted the official temperature record so it more closely accords with the theory of anthropogenic global warming,” according to a letter she wrote to Liberal Senator Simon Birmingham, whose parliamentary secretary portfolio includes responsibility for the agency. The Australian’s environment editor Graham Lloyd was approached to cover the “story” and stepped bravely forward with four pieces in recent days covering Marohasy’s claims. Lloyd wrote there was now an “escalating row” over the “competence and integrity” of the BoM despite the fact that Marohasy has not published her claims in a peer reviewed journal (the two papers mentioned in Lloyd’s story actually relate to rainfall prediction, not temperature). Contrary to assertions in some parts of the media, the Bureau is not altering climate records to exaggerate estimates of global warming. The BoM maintains several sets of data on temperatures in Australia and the agency makes all that data available online. One of those datasets is known as the Australian Climate Observations Reference Network – Surface Air Temperature (ACORN-SAT) and this is the one BoM used to declare 2013 was the hottest year on record. Marohasy has been looking at some of the temperature stations that are included in ACORN-SAT and analysing the impact of a method known as “homogenisation” that the BoM sometimes employs with the ACORN-SATdata. It’s no secret or even a revelation that the Bureau of Meteorology employs these techniques and others. On the bureau’s website, anyone is free to lose themselves in a world of homogenised data sets, gridded temperature analysis and temporal homogeneity adjustments. Go for your life. While Marohasy’s central claim – that BoM is doctoring figures to make them more acceptable to a narrative of warming - remains entirely untested in the scientific literature, the bureau’s methods used to compile ACORN-SAT have been peer reviewed. Unusually, the bureau’s full response to one set of questions from Graham Lloyd has found its way onto at least one climate sceptic blog. In the response the bureau explained why three specific site records it was asked about had been homogenised. At Bourke, for example, the station had been moved three times in its history. Detective work had found that a noticeable shift in the readings in the 1950s had likely been due to changes in vegetation around the instrument. At Amberley, the bureau noticed a marked shift in the minimum temperatures it had been recording, which was also likely due to the station being moved. Another site at Rutherglen had data adjusted to account for two intervals – 1966 and 1974 – when it's thought the site was moved from close to buildings to low-flat ground. Marohasy wants heads to roll [rolls eyes] because she claims that the Rutherglen site was never moved and so there was no need to homogenise the data. However, the bureau has documentary evidence showing that sometime before the 1970s the weather station was not in the place where it is now. The bureau had initially spotted a break or jump in the data that pointed to a likely move at Rutherglen. Perhaps all of these movements of temperature stations was a conspiracy in itself, cooked up in the 1950s? The original raw data is all still there – it has not been corrupted. Anyone can go and get that original data. Pre-1910 there was not much of a spread but also there was more uncertainty about how the temperatures were being measured. By 1910, most temperatures were being measured in a Stevenson Screen. A lot of measurements were taken at Post Offices but in many cases these were moved out to airports around the middle of the 20th century. That produces artificial cooling in the data. Towns for example in coastal New South Wales originally had temperatures taken near the ocean because that’s where the town was. But as the town grew the observations would move inland and that is enough to affect temperature and rainfall. Are we supposed to just ignore that? A scientist can’t ignore those effects. It’s not science to just go ahead and plot that raw data. 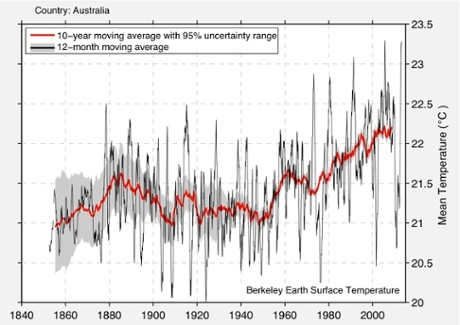 Nicholls said if people didn’t trust the way the BoM was presenting the data they could look elsewhere, such as a major project known as Berkeley Earth undertaken by former sceptic Professor Richard Muller which also used BoM data from as early as 1852 to mid-2013. Before joining CQU, Marohasy spent many years working at the Institute of Public Affairs – a Melbourne-based, free-market think tank that has been promoting climate science denialism for more than two decades. After leaving there, she became the chair of the Australian Environment Foundation, a spin-off from the IPA. Marohasy has said that Bryant Macfie, a Perth-based climate science sceptic, funds her research at Central Queensland University. In 2008, after Macfie had gifted $350,000 to the University of Queensland in a donation facilitated by the IPA to pay for environmental research scholarships there, he wrote that science had been corrupted by a “newer religion” of environmentalism. In June, Marohasy made her claims about BoM to the Sydney Institute. In July she travelled to Las Vegas to speak at the Heartland Institute’s gathering of climate science denialists and assorted contrarians. Also speaking in Las Vegas was federal MP for the Queensland electorate of Dawson, George Christensen, who appeared on a panel alongside Marohasy. Dr Lisa Alexander, the chief investigator at the ARC Centre of Excellence for Climate System Science, explained that in Australia it was not uncommon for temperature stations to be moved, often away from urban environments. She said that, for example, sites moved only a kilometre or so to more exposed areas such as airports would tend to record lower temperatures. That then creates a jump in the time series that’s not related to a jump in the climate. The bureau is altering the temperature data to remove those non-climatic effects that are due to changes like new instrumentation or site movements. Is the bureau fiddling the figures to fit with a global warming conspiracy? No! Are they amending the records to make them consistent through time? Yes. 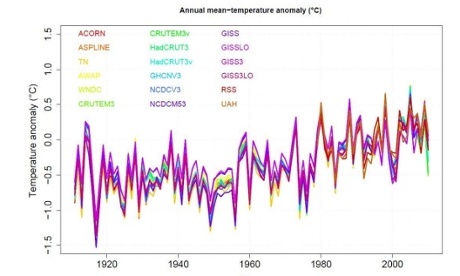 Also included in the BoM’s statement comes the following graph that overlays 18 different sets of temperature data for Australia – including (in yellow) another BoM dataset which is not homogenised. The graph also includes temperature measurements by satellite. Now either the satellites are also in on the warming conspiracy, or there’s something else going on. I wonder what that might be? Here is the Bureau’s statement in full. Our role is to make meteorological measurements, and to curate, analyse and communicate the data for use in decision making and to support public understanding. To undertake these tasks, the Bureau employs highly skilled technicians and scientists and invests in high quality monitoring equipment. The Bureau measures temperature at nearly 800 sites across Australia, chiefly for the purpose of weather forecasting. The Australian Climate Observations Reference Network – Surface Air Temperature (ACORN-SAT) is a subset of this network comprising 112 locations that are used for climate analysis. The ACORN-SAT stations have been chosen to maximise both length of record and network coverage across the continent. For several years, all of this data has been made publicly available on the Bureau’s web site. Temperature records are influenced by a range of factors such as changes to site surrounds (e.g., trees casting shade or influencing wind), measurement methods and the relocation of stations (e.g., from a coastal to more inland location). Such changes introduce biases into the climate record that need to be adjusted for prior to analysis. Adjusting for these biases, a process known as homogenisation, is carried out by meteorological authorities around the world as best practice, to ensure that climate data is consistent through time. At the Bureau’s request, our climate data management practices were subject to a rigorous independent peer-review in 2012. A panel of international experts found the Bureau’s data and methods were amongst the best in the world. The Bureau’s submissions to the review were published on the Bureau’s website, as were the findings of the review panel. The Bureau’s methods have also been published in peer-reviewed scientific journals. Both the raw and adjusted ACORN-SAT data and the larger unadjusted national data set all indicate that Australian air temperatures have warmed over the last century. This finding is consistent with observed warming in the oceans surrounding Australia. These findings are also consistent with those of other leading international meteorological authorities, such as NOAA and NASA in the United States and the UK MetOffice. The high degree of similarity is demonstrated in Figure 1 (above). The Bureau strives to ensure that its data sets and analysis methods are as robust as possible. For this reason we place considerable emphasis on quality assurance, transparency and communication. The Bureau welcomes critical analysis of the Australian climate record by others through rigorous scientific peer review processes.